There is a certain similarity between the planning of offices and the planning of flats when the offices are upon a large city scale, arranged in suites served by a common lift and staircase. The principal difference consists in the fact that there are less classes of rooms to provide for. A small suite consists of little more than the principal's office with a room for clerks opening out of it, and possibly a small telephone and typist's room, but in many cases it is advisable that there should be means of extension so that three, four, or even five rooms may be let for a suite if desired, each one having a separate entrance from a well-lighted corridor. Every room needs to have ample window space and wall space. The rectangular form is much the best, without breaks, for the only furniture to be introduced consists of desks, tables, and shelves for books, etc. - any odd corners can be usefully given up to safes and strong-rooms. As in English flat building, so in modern offices, the lift generally occupies the well of the staircase, there being a small room or cupboard for the porter close to it on the ground floor, and close also to the entrance from the street. The difficulty of providing proper light to all parts is much the same as in all classes of city buildings, and has often to be overcome by the introduction of comparatively small areas, which serve to give side lights to staircases and corridors on the upper floors, and top light to some of the less necessary rooms on the ground floor or basement. Space is so valuable in a large town that the basements are almost always occupied either with storerooms or the housekeeper's premises. 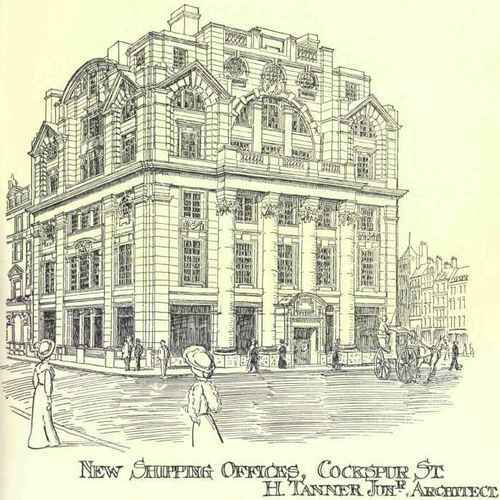 A typical set of London offices is that in Cockspur Street recently erected from the designs of Mr. Henry Tanner, Junior, illustrated in Fig. 21. It is more than usually interesting from the irregularity of the site, and, as frequently happens, the whole ground floor is given up to one large office, which might serve for an insurance company, bank, or many other purposes, it being in this particular instance used as a shipping office. It will be noticed that a large public room of rectangular shape occupies the greater part of the space, with a large swinging and rotating door in the middle of the frontage. A large amount of counter room is provided, with as much space as possible in front for the general public, leaving three desks and a small office for clerks behind. A passage beside the counter on the left leads to a waiting-room, from which the private office of the manager is entered, the manager's room having doors also both into the front general office and into the clerks' office, so that everything is under perfect control. 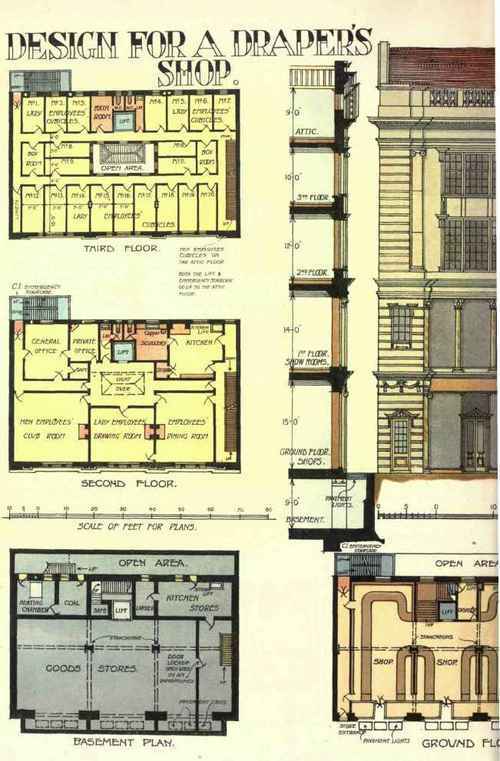 As there is a glazed partition shutting off these private offices from the general office in the front, the manager would be able to pass to the hall, and so into Cockspur Street, without being observed, and could also in this way pass out any visitors who did not wish to return through the waiting-room. Opening off this back passage there is a small room for a telephone, and three others for typists. These would all be constructed with sound-proof partitions, and would be top lighted from the areas shown on the second-fioor plan. The writing-room, which is shown opening on the right out of the general shipping office, would in many cases not be necessary, and would be occupied then by an assistant manager or by clerks, but it is a useful adjunct in a place where travellers from many countries might wish to congregate. A private staircase leading down to basement strong-rooms is to be seen close to the typists' rooms. 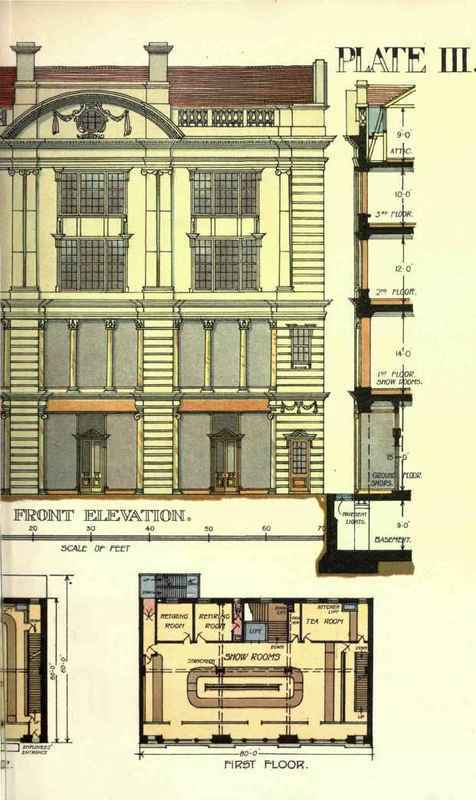 There is a side entrance from Cockspur Street into an architecturally treated hall, with lift and staircase rising to the upper floors, which are alike, varying only in small details to suit the elevations. There is a good landing on each floor with cupboards or strong-rooms opening out of it, while double doors lead to a side corridor from which all the offices are entered. As a general rule each floor would be let off as two suites, but in cases of necessity all could be thrown together by means of the communicating doors, or they could be let separately, except in the case of one small room, which is only to be entered through others. No particular effort has been made to render these rooms architecturally pleasing, the principal object evidently being to make them rectangular so far as possible, and to give each the maximum of light and of space, though in the matter of light those in the middle would not come very well off. 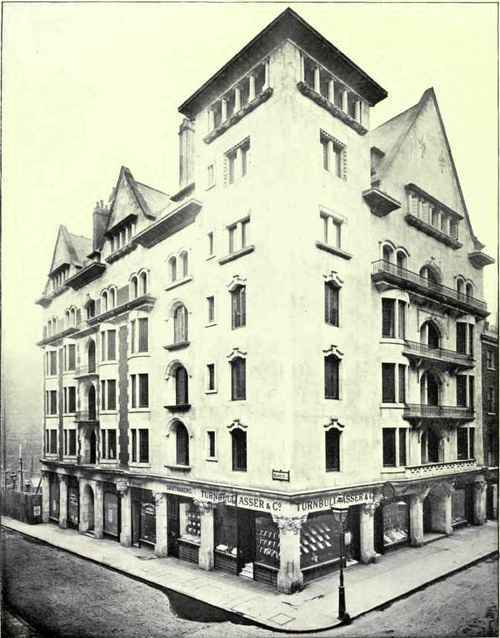 It being impossible to tell when they are erected for what businesses these offices would have to serve, they cannot be planned with any definite object, but it is always well to provide long windows to such rooms as have a north light, so that if necessary a drawing board or drawing table can be placed at the window. A somewhat unusual and clever variation of the common arrangement is shown in Fig. 22, which illustrates 38 College Green, Bristol, as rebuilt from the designs of Messrs. La Trobe & Weston. The site was narrow, long, and tapering. Offices had to be contrived on the ground floor for special use, and are so shown, with a large general office in the front and smaller offices for clerks and typists behind it, all top lighted from areas or side lighted from a small area at the back, where there is also a private staircase leading up to a small private office and lavatories. Under the main staircase, in the front, a small stair leads down to basement storerooms. Out of the recessed entrance, after passing through double doors, a wide staircase leads up to a tearoom on the first floor, and so up to farther similar rooms on the second floor and attic. The method of lighting is particularly noticeable, and the clever way in which the areas are used; and although there appears at first sight to be some little difficulty in the construction, this could easily be got over by the use of steel girders. This is an example of a combination of shops and offices in which the offices occur on the ground floor and the shops above, thus reversing a very general scheme. Shops and offices of this description would be closed at night time, unless special provision were made for a resident housekeeper, as would always be done in the case of large offices which could hardly be left without a caretaker. It is quite customary, however, to shut up small suites of offices and small shops. Plate II. Marlborough Chambers, Jermyn Street, W.
In the case of larger shops the arrangement is entirely different. They ought to be designed with special reference to the trades to be carried on in them, and in many instances provision has to be made for a large staff of assistants to live on the premises. This is particularly the case in drapers' establishments, of which an example is shown in Plate III. Here the ground floor is planned to provide a large amount of counter space, as well as plenty of room between the counters for the public to move about, with the usual narrow space behind the counters, and shelving again behind that, against the walls. There are three entrances to the shop from the street, and opposite the central one is placed a large lift which passes right up the whole building, as does also a small kitchen lift in one corner. A broad staircase winds round the lift up to the first floor, and under it is arranged an office for a cashier, with a small book lift to a similar office on the next floor, and well contrived stairs down to a safe in the basement. At either end of the frontage there is an entrance, one for employees on the right, and one for stores on the left, where there is a passage way to the back, communicating there with an external iron staircase carried both up and down. The basement is also reached by a stair from behind one of the counters underneath the employees' stair, and contains a large goods store which can be supplied through lifting pavement lights, and can itself supply the shop and showrooms by means of the lift. A heating chamber and coal store are found at the back on the left-hand side, and are balanced by kitchen stores and larder on the right. The first floor is given up to a large showroom with two retiring or dressing-rooms for customers, and a tearoom (such as large drapery establishments now generally contain), supplied from the kitchen above by the kitchen lift. Thus, so far as the shop is concerned, the convenience of customers has been studied, together with the provision of as much counter and show space as possible. It will be seen that large stanchions are carried up so far in the middle of the building, and that care has been taken to make them interfere as little as possible with the general convenience of working. These and the girders they carry enable fire-resisting floors of concrete and steel to be used, so that it is possible to place partitions on the upper floors wherever most convenient. This is taken advantage of largely, and the second floor is devoted to a general office for the use of clerks, out of which a safe and private office open, all easily reached by the external service staircase, the rest of the floor being given up to the living rooms of the employees, and their kitchen. It is not necessary to provide a very large dining-room, as, except on Sundays, there would always be double meals, for at no time could more than half the staff be spared from the counters. This dining-room is placed close to the employees' staircase and the kitchen, which latter is over the tearoom, and is provided with scullery and store. Probably, however, the employees would travel to and from their work by means of the lift, which on this floor opens upon a large central hall, from which the dining-room is also accessible, as well as two comparatively large rooms for private use by the men and women respectively. The third floor and attic are given over to small bedrooms or cubicles, the women being located on the third floor and the men in the attic. On each of these floors there are twenty such bedrooms, two boxrooms, and a linen-room and bathroom, arranged round an open area, with well lighted passages, and all served by the lift. Of course the rooms are small, but such an arrangement would probably be very much better appreciated than the provision of comparatively large dormitories. It will be seen that a building of this nature is a combination, of a shop with something very like a hotel.